That’s certainly what our road is – long and winding. It was our first introduction to the area as we drove up to view the house, and all of our visitors comment on it as well. The road seems to go on for much longer than you expect it to before you reach your destination, and it’s the twists and turns in it that really make it feel that way. If you were driving up from town along a straight road it would probably go by pretty quickly. 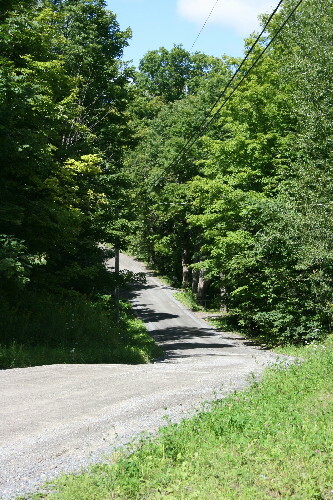 The combination of the gravel surface and the winding route slows traffic down, though, what little there is that traverses this road. The crunch of gravel under tires can also be heard for quite some distance before the car is actually upon you, so even though the shoulder is fairly minimal, it’s still a great road for walking down. Blackburnian and I had gone out a couple times for short walks down the road, but only a short distance. For the most part, the hiking I’ve done along the road only passed by forest. Near our house the landscape is nearly entirely forested, with the exception of a few scrubby areas underneath the power line corridors, or around the scattered houses along the road. 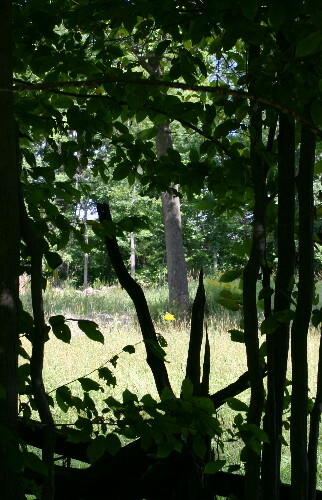 The forest seems fairly young, though, with few large, old trees growing in it. 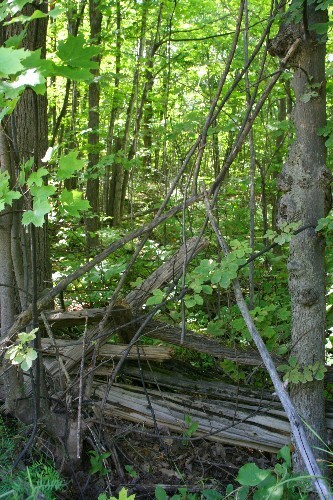 Further evidence of its history as agricultural land early last century are the split-rail fences that line the road, tucked into the edge of the forest. These fences are found throughout the area, and I really like them, I think they add a lot more character than newer wooden board fencing does. Yesterday as a break from work I decided to walk down as far as a large open field that I pass regularly when driving in to town. With some stopping and birding and photography along the way it took me about half an hour, which was a nice easy hike. Further south toward town you come down off the shield and the land levels out. There’s lots of agriculture and pasture down there, but once you’re up on the shield it’s mostly forest and lakes. 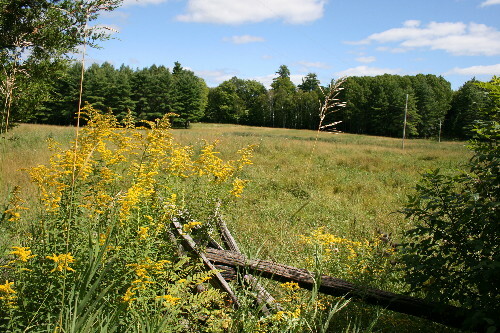 There are a few areas where enough land has been cleared (or was already naturally cleared) to create a reasonably-sized pasture. These areas aren’t common, though, particularly in the area around our house. So I’d been eyeballing these meadows thinking what interesting things might be happening there that I’d like to check out. Overlooked when just driving by but more obvious when walking, the fields had no trespassing signs posted that discouraged me from hopping the fence and wandering through the grass. Also rather discouraging were the blankets of poison ivy that lined the road edges. I know that I don’t react to poison ivy, but I also know that you’re not guaranteed of continued immunity forever, and I’d rather not push my luck. So I couldn’t get really close to the American Goldfinches in the fields, but the long lens on the camera meant I could at least get a photo. There were a few pairs of goldfinches moving about among the thistle stands, feeding on the seeds that would be maturing about now. Goldfinches would for the most part be at the height of breeding right now, and this is why – they delay their nesting to coincide with the maturation of thistle heads, which provide fluffy down for nest lining and abundant food for the adults and young. 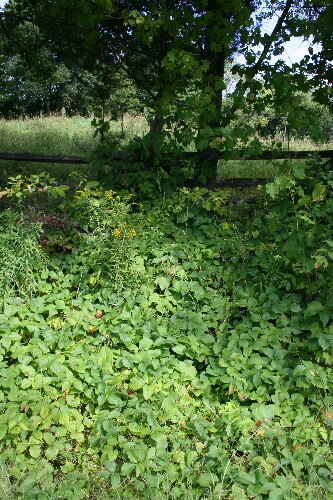 Where the fencing ran along the edge of the road there were a few tangles of shrubs and grapevines that provided good cover for birds. The goldfinches would pop in these occasionally, and I encountered a shy American Redstart who wouldn’t stay out long enough for me to get a photo. 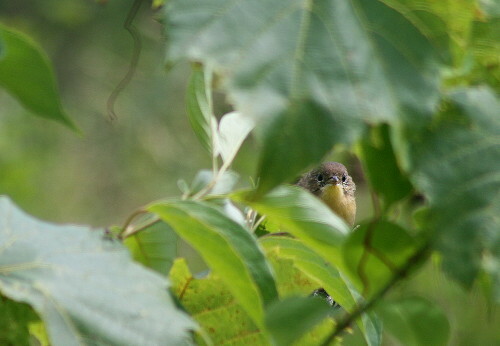 I also played hide and seek with this young Common Yellowthroat. He’d hop around inside the grapevine tangle and periodically poke his face out where I could see him. He seemed generally unconcerned by my presence, providing I didn’t get too close. After some patient waiting, he flew up to the top of one of the fenceposts, where he posed long enough for me to run off a few shots of him. Being right next to the road, I was able to get some nice clear photos that the other birds I encountered weren’t obliging enough to provide for me. After spending some time watching the goldfinches in the field, I turned around to start heading back, and back to work. Just as I was nearing the corner of the field I happened across a large flock of birds. I couldn’t tell what most of them were, so I started pishing to draw them out. Well. That did not go over well with this guy. 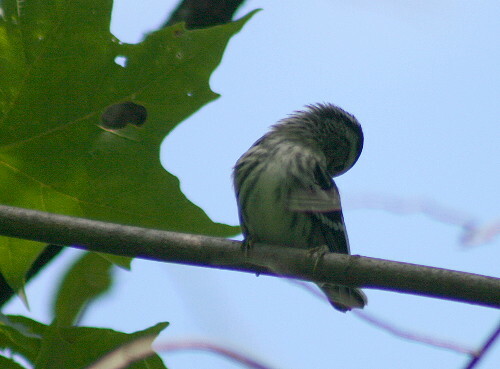 I assume there were little Indigo Bunting fledglings somewhere nearby and he was getting upset over my presence, and further aggravated by my pishing. He sat there and chipped and chipped at me for a bit, before retreating to a shrub a bit further back. You can actually see in this photo he’s eating a seed at the same time as telling me how upset he is with me. 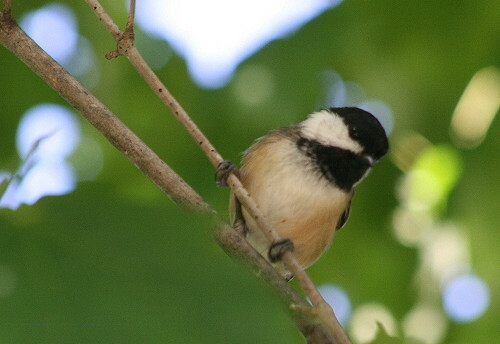 The chickadees, on the other hand, are more curious than upset. You can almost always get a flock of chickadees to come in to check you out when you pish at them, and they’ll come in remarkably close if you’re standing in vegetation – almost too close for me to focus on with my 300mm lens. Eventually, once they determine that it’s just some crazy kook making weird noises with her mouth, they move away and carry on with whatever they’d been doing at the time. The Chipping Sparrows were also curious about what was going on. In fact, the only birds to really be alarmed were the buntings. There were lots of chippers about, they seemed to make up the bulk of the flock. It’s interesting that they’ve been the most abundant sparrow in our area, it surprises me a bit. 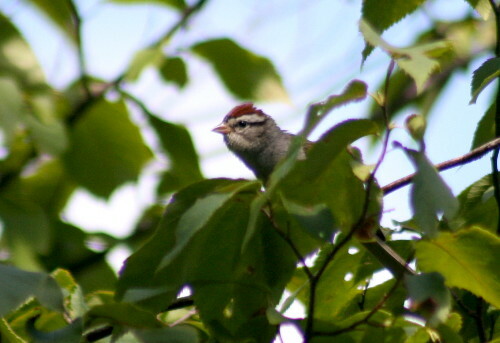 I would have expected Song or White-throated to be more common in our predominantly forested area, as I think of chippers as shrub birds, but I guess early successional forests have a lot of undergrowth that would suit them well, too. We’re also in the primary hotspot for Eastern Towhees in the province, but have only heard one since we arrived; I expect we’ll see more when they start to migrate. In with the chickadees and chippers was this lone Black-and-white Warbler. She came in and checked me out initially, then, as the chickadees did, decided I was of no real concern. However, instead of moving away again, she sat on her branch and preened for a while. 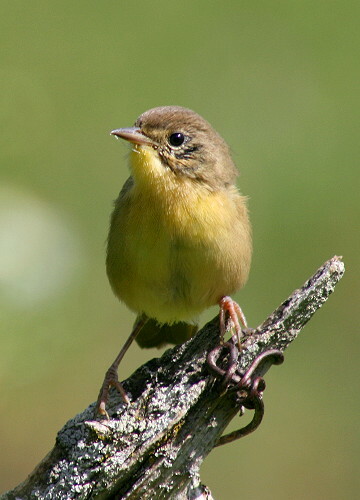 A bird’s feathers are its lifeline; they’re necessary for flight and for insulation (warmth in cool weather, cooling in warm weather), as well as social signals that indicate the bird’s status and health. Because they’re so important, birds will spend hours every day doing nothing but preening their feathers to make sure they’re in good working order. August really is the slowest time of the year for birding, so I’m encouraged by the activity I saw there yesterday, of primarily post-breeding dispersals. Once migration starts I’ll be interested to see what else turns up along those hedgerows and in the fields. I’m also looking forward to seeing what breeders we have around when everyone returns to set up shop next spring. That walk was certainly worthwhile! 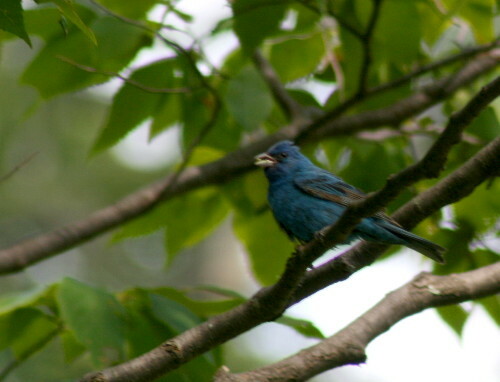 I’ve seen an Indigo Bunting only once, a few years ago at Presqu’ille. I didn’t realize they had crests, and your photo surprised me because my first thought was it was a blue cardinal! I enjoyed that walk and I needed the break after a long day in court–thanks! That is really interesting about the Goldfinches. Thistles here in BC are just maturing too. Up in the alpine area, some are just opening up. Just in time for the descent into autumn and winter. I found your site from search engine. Facinating with all those beautiful birds pictures. Lavenderbay – I don’t think Indigo Buntings have crests the way cardinals or Blue Jays do, but they can get a little peak to their head when they raise all their head feathers, as this guy has done. It’s a behaviour you often see in birds that are alarmed or angry, they’ll puff all their feathers up in an attempt to make themselves look bigger and more intimidating. Glad you enjoyed it, Beth – I’d be tired after a long day inside, as well! 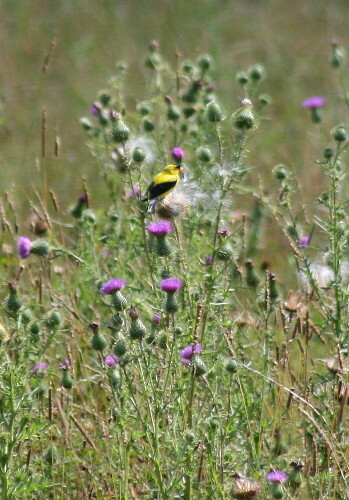 That’s pretty late timing for thistles, Huckleberry – I have to imagine that there the goldfinches would use something else to line their nest if that was the case, though I could see them still turning to them as a predominant food source once they mature. Thanks, Tabib, happy you stopped by! Next Next post: Get out and look!